After Lady Susan, she began to write an early version of Sense and Sensibility, which she called Elinor and Marianne. Originally, it was written as an epistolary novel (told in letters, like Lady Susan), and she revised it considerably before publication in 1811. The final draft of the novel is told in third-person narrative instead of epistolary form. However, as the first drafts of the manuscript didn’t survive, we don’t know if there were plot changes as well as format changes. Edward admiring Elinor’s drawing in Sense and Sensibility. About a year after Austen wrote Elinor and Marianne, she started work on the first draft of Pride and Prejudice, titled First Impressions before publication. It is very likely that she took the final title from one of Fanny Burney’s novels, Cecilia, a popular novel which Austen almost certainly read. It took many years between the first draft stage, revision and final publication for Austen’s early novels — such as S&S and P&P — to be published. But once her publishers accepted the first novel, the rest were published in quick succession. Some of them even sold out and second editions had to be printed to keep up with demand! Since 1833, Austen’s novels have never been out of print. Jane Austen’s novels are enjoyed around the world in many different languages. A notable element of Austen’s writing is that she uses details sparingly; the phrase, “show, don’t tell”, perfectly describes her writing. There are few specifics about what the characters look like, what they wear, what they eat, etc. Equally, she doesn’t write explicitly about the personalities of her characters. Consider the example of Marianne Dashwood. BTake the Jane Austen Character Quiz here!y reading her interactions with her sister and watching as she falls for the scoundrel, Willoughby, we learn far more about her character than if Austen had merely used adjectives to tell us about her personality. A still of Kate Winslet as Marianne Dashwood in the 1995 adaptation of Sense and Sensibility. An extract from chapter 16 of Sense and Sensibility, which shows that Marianne loves the picturesque but is less fond of being practical. Austen wrote about what she knew. Her novels are full of social realism of the times in which she lived, but her themes are universal: self-discovery and personal development, love, marriage, human interactions and the desire for happiness. Although we live in a different social context than Georgian England, these themes are still relevant to readers today. Which Jane Austen novel is your favourite? And which Austen heroine are you most like? Let me know in the comments section! This entry was posted in Between the Pages, Books and tagged books, classic literature, fiction, Jane Austen, Jane Austen's writing, literature, novels, period drama, reading, Sense and Sensibility by Grace @ Cultural Life. Bookmark the permalink. 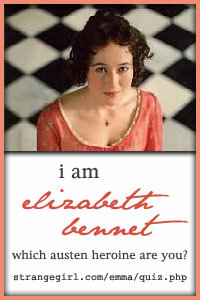 Well, that has to be Elizabeth Bennet. 🙂 I am not really much like her (although we both tend toward being acerbic) but I love how principled and loyal she is, even when she’s wrong. She’s a wonderful character, so realistic and finely drawn. I agree — she is such an enchanting character. 🙂 I wouldn’t consider myself to be exactly like her, but I can relate to her independent spirit. P&P is my favourite, but Eleanor is the character I’m probably most like. Although it’s not as much fun as P&P, I think S&S is a better book in that I think it’s more insightful about the society of the time. P&P is “light and bright and sparkling”, as Austen said, but I agree with you that S&S has more contextual details. That makes it a more interesting read to me in terms of the social backdrop. Also, I’d say that I’m more like Elinor (generally sensible, thoughtful, practical and someone who feels deeply) than Lizzy… I was surprised at my quiz result!